Barry Kislowicz is the Global Division Director at the Center for Educational Technology in Israel. Prior to making aliyah last summer, Rabbi Dr. Kislowicz spent twelve years as principal and head of school at the Fuchs Mizrachi School in Cleveland, OH. He is the author of Parenting in Perspective (Maggid, 2016). Barry Kislowicz examines the roles that faculty play during tefillah and how they can be shifted. The last six months have been the first time in over 13 years that I have attended a daily shul minyan rather than davening with a group of high school or middle school students. I won’t lie. There were many mornings over the years when I longed to daven in a minyan where I was not responsible for keeping students engaged, where I was not responsible for keeping anyone quiet or making sure they were on the right page. In short, where I was not responsible for anyone but myself. And, of course, there are benefits which I experience now in my tefillah that I missed all those years. At the same time, sooner than I thought I would, I began to miss the vibrancy, energy and meaning that comes from praying with students. The push-pull of this experience has highlighted what I believe is one of the central challenges that we face in middle and high school tefillah education. Most educators choose the profession partly because of a desire to teach and partly because of their own love for spiritual growth and Torah learning. In the classroom, these two drives can reinforce one another and support our practice. The preparation of a particular course or lesson demands pre-study by the teacher, feeding his or her own desire for learning, while at the same time enabling him or her to acquire the knowledge necessary to facilitate student learning. Confronted by questions from curious students, the teacher returns to his or her own learning and deepens his or her own knowledge while searching for a response. Of course, it is clear that there are many frustrating and even disheartening interactions with students who may not share the teacher’s passion for learning. However, the potential for reinforcement does exist and it gives educators a goal for which to strive. Contrast this with the case of tefillah, where these two drives seem to create a fundamental tension in the case of the middle or high school minyan. As a principal I often found that teachers who were most committed to their own tefillah struggled more in the school tefillah setting. Dedication to our own tefillah tends to lead us to desire a more direct and singular focus on our own conversation with God. The idea of distraction is antithetical to successful tefillah, and what could be a more potent distraction than a group of chatty middle school students?! To put it a bit differently, the distinction between the class setting and the tefillah setting is that teachers do not expect to accomplish their own personal Torah learning during class time. They may share, deepen, or explore, but they do not hope to fundamentally focus on their personal learning. In contrast, the teachers who arrive on Monday morning to the 8:00 school minyan typically do intend to accomplish their own tefillah together with the student tefillah. There is certainly an advantage to this, as teachers are often the most wonderful role models for students to observe and emulate as they engage in their own tefillah. Unfortunately, it seems that often the benefit does not outweigh the loss. Teachers who are frustrated with their inability to pursue their own tefillah often have less patience with students who may be less engaged. As people committed to tefillah, how can we pursue our own tefillah while simultaneously supporting and facilitating student engagement? Put more broadly, how can we better align teachers’ spiritual commitment and passion with the practice of tefillah in middle and high school? How can we achieve a reinforcing effect more similar to what happens in the best classrooms? As with many of the challenges we face, the first step is to acknowledge the tension. Too many administrators simply assume that for staff, davening at school is a substitute for davening with a shul minyan. We must recognize for ourselves and share with other faculty explicitly that tefillah with students is not the same as our own personal tefillah. If educators do view the school minyan simply as another venue for our own personal tefillah we will ultimately see it as a frustrating compromise. 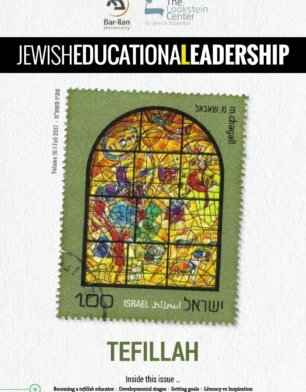 In contrast, if we understand that we cannot accomplish our own tefillah in the school minyan as we would in a synagogue minyan, we open the door for a deeper exploration of the educator’s role in school tefillah. This exploration may begin with the question of what teachers should come to expect from their own tefillah in the school context. Along these lines, we may be able to develop a new perspective. We may ultimately come to see educational-tefillah as a different experience: not our personal tefillah minus the distraction of students, but a new and distinct form of educational spiritual engagement that, similar to classroom Talmud Torah, complements our own adult approach. At the same time, the exploration may lead us to an alternate approach. Rather than assuming all teachers can find meaning in tefillah with students, we can begin to ask whether, in fact, all faculty should daven in the school minyan. Having at least some of our teachers daven on their own prior to school opens the door for us to reconsider those teachers’ role during school tefillah. And yet, the questions this raises about the teacher’s role may be part of what prevents most schools from looking in this direction. Schools will see resistance from teachers who will need to get up an hour earlier to attend shul minyan. They may encounter more resistance, however, from teachers who simply do not understand what they should be doing in the school minyan if they have already davened. Think about a circumstance in which a teacher has attended an earlier minyan for some reason: teachers who go to a local shul for a brit milah or attend shaharit at a shiva home. If these teachers then arrive at school in time for regular tefillah they typically make their way to their desk in the faculty room rather than to the bet midrash. Ask such a teacher why they are not in the school minyan and the answer is simple: s/he already davened! Having already davened, the teacher has no idea what s/he would do at school tefillah. Therefore, the best place to start our attempts to facilitate change may be with a direct examination of what an educator’s role might be in school tefillah when s/he is not davening. Now that we are not worried about the educator’s own personal tefillah, this question can be clearly focused on the students. What do students need from their teachers to enhance the tefillah experience? Assistance with the technicalities of tefillah: helping students find the place, understand what to do if they come late or can’t keep up etc. This of course, is at the heart of the matter. There are many strategies that help us engage students during tefillah. One of these is role modeling, which can be best accomplished by a teacher who davens during minyan. 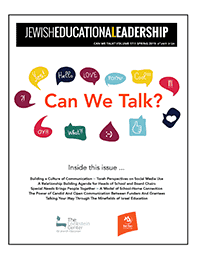 Others, which may be better accomplished by teachers who are not simultaneously trying to pursue their own tefillah, can include dramatic and interactive presentations, integration of multimedia, artistic experiences meditation, song and more. Individual attention. This is something we can rarely achieve in today’s typical setup. Other than a hand on a shoulder or a whispered word from time to time it is very challenging for teachers to both daven and give individual, differentiated attention to students. Teachers who are not davening can more easily share an encouraging word or have a private conversation outside the room if necessary. They can also implement individualized plans for students who need specific accommodation during tefillah, such as participating at specific points or having alternative options. Depending on the school and student needs, the discussion may proceed from here in a number of directions. It should develop to the point where the faculty members and school leaders involved in tefillah have a detailed plan to address students’ educational needs as they relate to tefillah. Of course, the idea of creating a proactive plan for tefillah education is not new. What is unique about this proposal is the simple yet transformative idea that we can achieve immeasurably greater success if we eliminate the tension between teachers’ commitment to their own tefillah and their ability to facilitate student tefillah. We can do so most directly and powerfully if we encourage at least some of the teachers to fulfil their own tefillah requirement before coming to the school minyan. There may always be some teachers who daven with the students and who serve as direct, real-time role models. However, the majority of teachers will be freed to approach minyan just as they approach each class they teach: with a clear and direct focus on the students’ needs, and with the freedom to implement a much wider variety of educational interventions in pursuit of these goals. In truth, having teachers daven beforehand not only frees them from the tension we discussed earlier, but also creates an opposite tension: Teachers who are present at minyan without needing to daven will want to do something productive. They will want to feel useful and to contribute, and as such they will be more naturally inclined to seek out ways that they can intervene educationally to improve the students’ tefillah experiences. Early in my career, a senior Rabbi and educator remarked to me that he had given up his own tefillah in order to facilitate that of his congregation and students. I remember vividly feeling a sense of sadness on his behalf, the cobbler himself having no shoes. This is not a healthy approach for our teachers, and it is not a productive approach for our students. The solution lies in a simple change which can provide the foundation to transform our tefillah education if only we are willing to consider it.